“There are no faint hearts in Fort Worth.” Those were the words of President John F. Kennedy on the morning of Friday November 22nd, 1963. On that rainy and chilly morning thousands gathered in front of the Hotel Texas in downtown Fort Worth to listen to his final outdoor speech. Just a few hours later President Kennedy was assassinated at Dealey Plaza in Dallas. On the evening of November 21, 1963, JFK and his wife Jackie arrived from Houston at Carswell Air Force Base in Fort Worth. Although the presidential plane Air Force One arrived at 11:05 pm thousands assembled at the airport to welcome the President and First Lady. Both were thankful for such an enthusiastic welcome and approached the crowd to show there gratitude. When the presidential limousine arrived at the Hotel Texas, about four thousand people waited and applauded. It was passed midnight when JFK and Jackie entered their suite: check photos of the room here and here. As for today, suite 1530 is still a tribute to JFK’s last night. On the walls around the entrance pictures of JFK and Jackie are commemorating their stay and the Presidents last night. It is possible to stay in the same room. Those who consider a night in the same suite have to pay 2,500 dollars for one night. The next morning again thousands gathered at the crack of dawn in the front of the Hotel Texas. JFK was about to speak. It was clouded, chilly and rainy. The audience was soaked. When JFK came out of the hotel he said: “there are no faint hearts in Fort Worth“. He talked, among other things, about his respect for the courage, strength and importance of the military defense and Fort Worth’s invaluable role. After some moments of handshakes JFK returned to the hotel for what turned out to be his last meal. There he joined his wife, Vice President Lyndon B. Johnson and Texas governor John Connally to deliver his remarks at a Chamber of Commerce Breakfast. He stepped up to the podium and said: ‘Two years ago, I introduced myself in Paris by saying that I was the man who had accompanied Mrs. Kennedy to Paris. I am getting somewhat that same sensation as I travel around Texas’. The audience laughed. Then he said, after glancing at Jackie in her famous pink suit: ‘Nobody wonders what Lyndon and I wear’. After his speech, the presidential couple left the Hotel Texas at 10:40 am for Carswell Air Force Base. The crowd was cheering on Main Street. JFK’s next destination: Dallas Love Field Airport and the Dallas Trade Mart. He would never arrive at the Trade Mart after shots were fired at his presidential limousine on Dealey Plaza. As for today, the Hotel Texas, now the Hilton Fort Worth, still commemorates JFK’s stay and last night. In November 2012 a special JFK Tribute was erected in General Worth Square at the southeast corner of Main and 8th Street, immediately adjacent to the hotel. The park is a former parking lot where JFK held his speech. The tribute contains a bronze sculpture of President Kennedy, created by the late Lawrence Ludtke. The plaza is also featured by photographic displays and selected quotes from several famous speeches by JFK. When it’s dark, lights shine at the JFK Tribute. The hotel, completed in 1921, is part of the National Register of Historic Places. 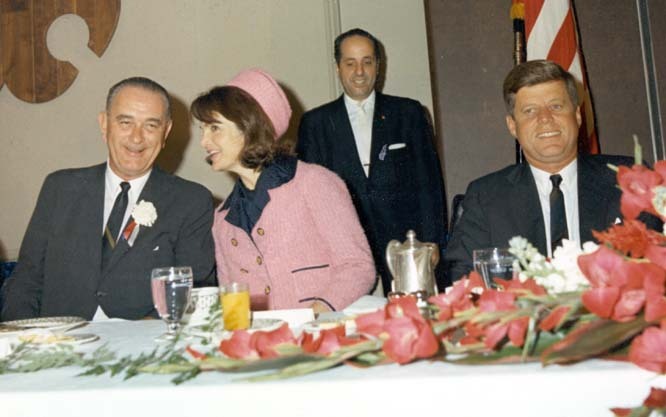 Minor correction – The photo depicting JFK’s final breakfast meal is from the breakfast speech (JFK didn’t actually eat breakfast then) He ate breakfast earlier in his hotel suit which was catered to him by an African American steward. The breakfast consisted of two eggs boiled for 5 minutes, toast with a side of marmalade, a pot of coffee and orange juice.